WASHINGTON, D.C. - A unique window of opportunity for humankind will open in January 2018, and the Inspiration Mars Foundation intends to seize it, announcing plans today to pursue a challenging manned mission to Mars and back. This historic 501-day journey around the Red Planet is made possible by a rare planetary alignment that occurs five years from now. Two professional crew members - one man, one woman - flying as private citizens will embark on what is known as a "fast, free-return" mission, passing within 100 miles of Mars before swinging back and safely returning to Earth. Target launch date is Jan. 5, 2018. Officials with the Inspiration Mars Foundation, a new nonprofit organization founded by private space traveler Dennis Tito, announced their plans to pursue the audacious to provide a platform for unprecedented science, engineering and education opportunities, while reaching out to American youth to expand their visions of their own futures in space exploration. "When nations boldly follow opportunities, rooted in curiosity and guided by technological innovation, they grow, prosper, learn and lead. And this is what makes a nation great," said Tito, chairman of the Inspiration Mars Foundation. "Human exploration of space is a critical catalyst for our future growth and prosperity," he added. "This is 'A Mission for America' that will generate knowledge, experience and momentum for the next great era of space exploration. It will encourage and embolden all Americans to believe, again, in doing the hard things that make our nation great, and inspire the next generation of explorers to pursue their destiny through STEM education." The mission will be built around proven, existing space transportation systems and technologies derived from industry, NASA and the International Space Station that can be available in time to support the launch date. "Investments in human space exploration technologies and operations by NASA and the space industry are converging at the right time to make this mission achievable," said Taber MacCallum, chief technology officer for Inspiration Mars. MacCallum is also CEO/CTO of Paragon Space Development Corporation, and was a member of the Biosphere 2 Design, Development, Test & Operations team, and a crew member in the first two-year mission. The mission system will consist of a modified capsule launched out of Earth orbit using a single propulsive maneuver to achieve the Mars trajectory. An inflatable habitat module will be deployed after launch and detached prior to re-entry. Closed-loop life support and operational components will be located inside the vehicle, designed for simplicity and "hands-on" maintenance and repair. "Mars presents a challenging, but attainable goal for advancing human space exploration and knowledge, and as a result, we are committed to undertaking this mission," MacCallum said. "Experts have reviewed the risks, rewards and aggressive schedule, finding that existing technologies and systems only need to be properly integrated, tested and prepared for flight." Tito explained that the "beauty of this mission is its simplicity." The flyby architecture lowers risk, with no critical propulsive maneuvers after leaving Earth vicinity, no entry into the Mars atmosphere, no rendezvous and docking, and represents the shortest duration roundtrip mission to Mars. The 2018 launch opportunity also coincides with the 11-year solar minimum providing the lowest solar radiation exposure. The foundation serves as the primary contractor for the mission, overseeing planning, training, systems development, processing and operations. Several companies and individuals recognized for their excellence in various aspects of human spaceflight will manage key program elements. Subcontractors include Applied Defense Solutions, Paragon Space Development Corp. (Paragon), and Dr. Jonathan Clark with the Center for Space Medicine at Baylor College of Medicine. In addition, we have formed a partnership with NASA via a reimbursable Space Act Agreement between Paragon and the Ames Research Center (Ames). "With the support of NASA and an evolving team of industry partners, we intend to do everything possible to take advantage of this unique opportunity for America," Tito said. "We are engaging the best minds in industry, government and academia to develop and integrate the space flight systems and to design innovative research, education and outreach programs for the mission. This low-cost, collaborative, philanthropic approach to tackling this dynamic challenge will showcase U.S. innovation at its best and benefit all Americans in a variety of ways." Those benefits include cutting-edge research and potential discoveries. The mission validates decades of taxpayer investment in NASA technology, and strengthens the nation's position as a leader in exploration. It also serves as a vehicle for inspiring youth through science, technology, engineering and math (STEM) education and motivation. The foundation is already collaborating with nationally prominent educators, organizations and space experts to design a compelling educational K-12 program. The Space Act Agreement between Paragon and Ames is to conduct thermal protection system and technology testing and evaluation. Foundation officials will also seek to tap into NASA's knowledge, experience and technologies to fine-tune and/or develop some of the more challenging elements of this mission, including environmental controls, radiation protection, and human health and productivity plans. Tito said the Inspiration Mars mission aligns perfectly with emerging U.S. space priorities and programs, and will contribute valuable research to accelerate next-generation systems and their missions. "The mission will help create public awareness, enthusiasm and momentum for a long-term commitment and vision for space exploration beyond low-Earth orbit ... all the way to Mars," Tito said. "Clearly, there are risks associated with the mission, as is true of every space exploration mission. But these are exactly the kinds of risks that America should be willing to take in order to advance our knowledge, experience and position as a world leader. We believe the risks and challenges we have identified are well within the scope of our collective experience and can be overcome to achieve a safe and successful mission." The Inspiration Mars mission stems from a year-long effort to develop a series of similar fast, free-return trips to the Moon and back. After this fortuitous alignment of planets in 2018, the opportunity will not present itself again until 2031. 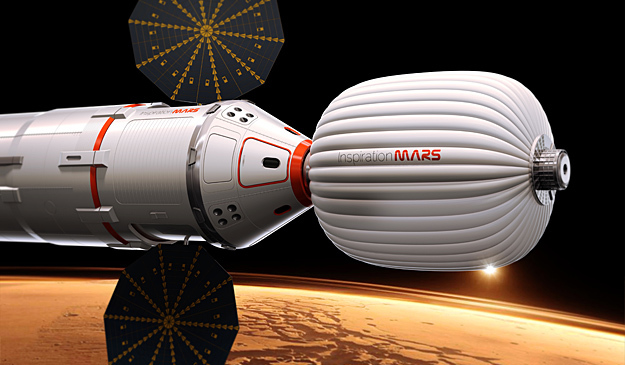 Inspiration Mars will be funded primarily through private, charitable donations. The foundation will also seek out government partners that can provide unique expertise, access to infrastructure and other technical assistance as part of a public-private partnership. For more information, visit www.InspirationMars.org.